TACA International Airlines Flight 110 was a regularly scheduled passenger flight between San Salvador, El Salvador, to New Orleans, Louisiana, USA with an en route stop in Belize City, Belize. The airplane, a brand new Boeing 737-300 with 38 passengers and a crew of seven on board, departed as scheduled from Belize City, and the flight was uneventful until descent into New Orleans. During descent from FL350 for an IFR arrival to New Orleans, the flight crew noted green and yellow returns on the weather radar with some isolated red cells, left and right of the intended flight path. Before entering clouds at FL300, the captain selected continuous engine ignition and activated engine anti-ice systems. The crew selected a route between the 2 cells, displayed as red on the weather radar. Heavy rain, hail and turbulence were encountered. At about FL165, both engines flamed out. The APU was started and aircraft electrical power was restored while descending through about FL106. Attempts to wind-mill restart the engines were unsuccessful. Both engines lit-off by using starters, but neither would accelerate to idle; advancing the thrust levers increased the EGT beyond limits. The engines were shut down to avoid a catastrophic failure. An emergency landing was made on a 6060 feetx120 feet grass strip next to a levee without further damage to the aircraft. 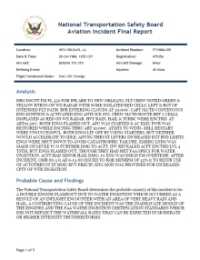 Investigation revealed that the aircraft encountered a level 4 thunderstorm but engines flamed out, though they had met the FAA specs for water ingestion. The aircraft had minor hail damage; the #2 engine was damaged from overtemperature. The 737 took off from the field on June 6. PROBABLE CAUSE: "A double engine flameout due to water ingestion which occurred as a result of an inflight encounter with an area of very heavy rain and hail. A contributing cause of the incident was the inadequate design of the engines and the FAA water ingestion certification standards which did not reflect the waterfall rates that can be expected in moderate or higher intensity thunderstorms." After the incident, OMB 88-5 and AD 6-14-88 were issued to require minimum rpm of 45% and to restrict the use of autothrust in moderate/heavy precipitation; engine modification was provided for increased capacity of water ingestion. Despite of this AD, a Continental Airlines B737-300 suffered a nr.1 engine flameout while descending through heavy precipitation with throttles at flight idle, July 26, 1988. The co-pilot warned the captain of the fact that idle descent was contrary to recently published procedures, but idle descent was continued. Distance from Belize City-Philip S.W. Goldson International Airport to New Orleans International Airport, LA as the crow flies is 1391 km (869 miles).